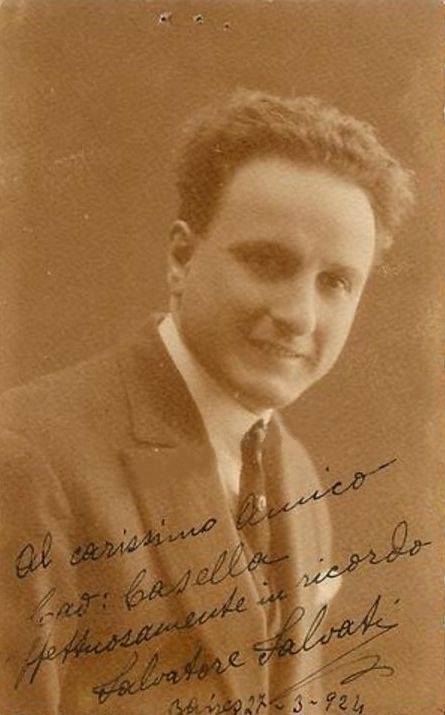 He made his debut in 1908 at Caserta (near Naples) as Almaviva in ‘’Il barbiere di Siviglia’’. Then he had a significant career in Italian stages and appeared also in South America, among other things at the Teatro Colón in Buenos Aires. In 1925 he guested at La Scala, Milan as Florindo in ‘’Le Donne curiose’’ of E. Wolf- Ferrari. He lived later in Switzerland where he appeared at the Municipal Theatre of Basel, but also in Zurich and in Bern as a guest. He was the founder of the Salvati-Vocal quartet (with Leni Neuenschwander, Paula Koelliker and Karl Theo Wagner) which gave concerts in numerous European towns. Approximately in 1930 he finished his stage career, but in 1941 again appeared on the stage (Municipal Theatre of Bern). Later He became a singing teacher first at the Salzburg Mozarteum, then at the Basel Conservatory.